Let me preface this with 1) I’ve been drinking and 2) I’ll continue to drink through the creation of this article. Let’s hit it. Coach Cronin and his team after winning the 2019 AAC Tournament. 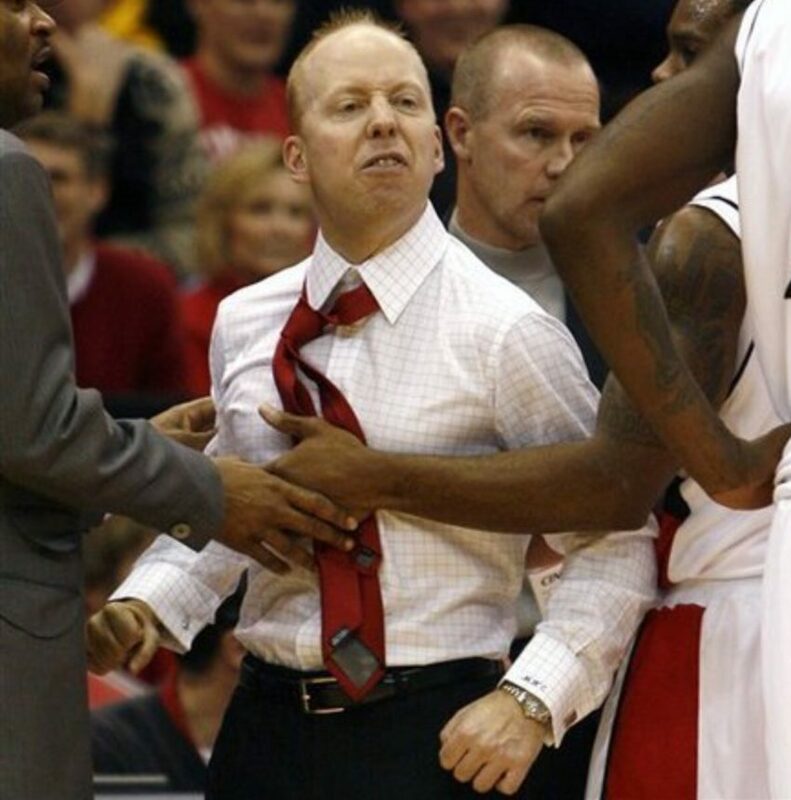 For the past 13 years Mick Cronin has been the head coach of the UC Bearcats men’s basketball team. In that time he has become the second, most winningest coach in UC history, 296–146 (.670), only behind Bob Huggins, 399–127 (.759). Cronin graduated from Westward HS and the University of Cincinnati ’97. He has left his alma mater for the historical UCLA and the PAC-12. Cronin is reported to have signed a 6 year, $24 million contract. He’ll inherit a roster chalked full of talent and highlighted by Shareef O’Neil, Shaq’s son who had to forfeit his freshmen year to undergo heart surgery. He’s since been clear and ready to go. 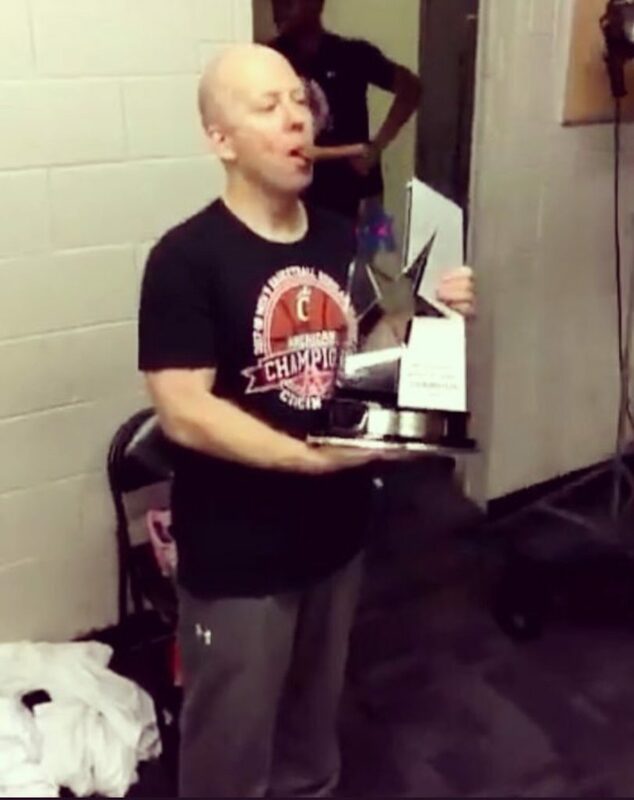 Coach Cronin after winning the 2018 AAC Tournament. After the latest early exit from the NCAA Tournament again this year there was a segment of UC fans calling for Cronin’s head. After all his tournament record was a less than stellar 6-11 overall. That along with a stagnant offense was the biggest gripe against him. People have incredibly short memories though. Cronin took over at UC when the program was in shambles. He had virtually no recruits and had to enlist football players to fill out a roster. He left the program after winning 89 game in three seasons and winning back to back AAC tournament championships. The Era of Cronin brought us players that will live in Bearcats lore like Deonta Vaugh, Yancy Gates, Sean Kilpatrick, Gary Clark, and Jarron Cumberland. The Cincinnati name hasn’t been a national brand for quite some time now but some fans refused to believe that for the past couple of years. You could blame Cronin or maybe Nancy Zimpher or others but regardless of who you blame you’ll soon realize the sobering reality of how limited Mike Bohn’s options are for the next head coach of the UC basketball Bearcats. I wish nothing but the best for Mick and his future endeavors. I think he is taking a huge gamble by taking this job. There’s a ton of pressure to win out there, if you don’t believe me ask Steve Alford. Early exits from the tournament won’t be tolerated at the same rate it was here. I hope he’s successful in Westwood. 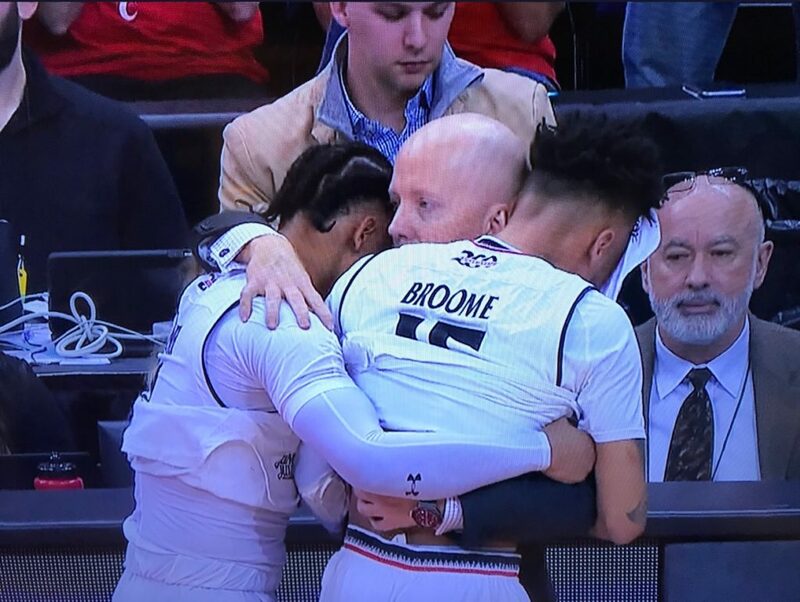 Coach Cronin embracing seniors Justin Jenifer and Cane Broome after their loss to Iowa. Lots of names being thrown around for the @gobearcatsmbb job opening. Think about this… UC Football coach Luke Fickell is the longest tenured coach in major Cincinnati sports. Let me start off by saying that the current UC roster is set up for success next year. As I sit here I’m assuming Teddy is coming back next year. You have the entire roster back other than Jenifer and Broome. You have a freak of an athlete in Logan Johnson ready to assume the role of point guard and 2019 Mr. Ohio Samari Curtis coming in for next season too. The Bearcats will be ready to dominate the AAC again. You can tell me that UConn will be the team to beat next year and I’ll laugh in your face. I’d pick them fourth or fifth. Cincinnati, Houston, and Memphis should all be ahead of them. Even considering the state of the AAC the short sided part of me wants to say it’ll be easy to win early. We know that recruiting is the lifeblood of a program though. You obviously want to bring in a coach who can recruit. Twitter is ablaze right now with coaching talk. We don’t know for sure who Mike Bohn has or will call for the vacancy the only thing we know for sure is that everyone on twitter will have an opinion. The Beercat is not an exception, I too have an opinion. If I’m Mike Bohn I’m calling UC legend, former NBA All Star, and current Memphis Grizzlies assistant coach Nick Van Exel. There are some other names out there that might make a lot of sense. Current NKU coach John Brannen will be on the short list. West Virginia assistant coach Eric Martin might get a call as well. He has the pedigree. Former head coach of Vandbuilt Bryce Drew might pop up, I’ll pass. Steve Forbes, Porter Moser, Keith Dambrot, Mike Anderson, Craig Smith, Tim Miles all might see their name on list here and there. I’ll take Nick the Quick over all of them. The short sided part of me wants to say it’ll be easy to win early. We know that recruiting is the lifeblood of a program though. You obviously want to bring in a coach who can recruit. Van Exel probably propelled this talk with a tweet last week. Uc need to hire @vanexel31 or bring Andy Kennedy back. Woj dropped a bomb too, NVE wants it. Even a former Memphis Grizzlies assistant and newly hired Vanderbilt Coach threw in his support of NVE. NVE doesn’t have experience on the DI college level. He doesn’t have an established recruiting pipeline like Penny Hardaway. He’s untested and a bit of a wildcard because of this. Some will say former players that come back and coach don’t have a great track record. I get it but here’s why we need to take this small, measured gamble. The fanbase has been a disgruntled one for about 14 years or so. I’ve talked to plenty of people who are still mad about the Huggins exit. Warranted or not those people still live in or around the city and can still buy tickets to games and watch them on TV, they’re usually pretty vocal too. A hire like NVE could reunite the fanbase and give the Bearcats a unparalleled fandom. NVE was on the last Bearcats team to reach a Final Four. He’s well knows around these parts. A lot of fans in this city are insufferable they’ll find a reason to complain about anything. I don’t see how that wing of fans would be upset about a NVE hire. 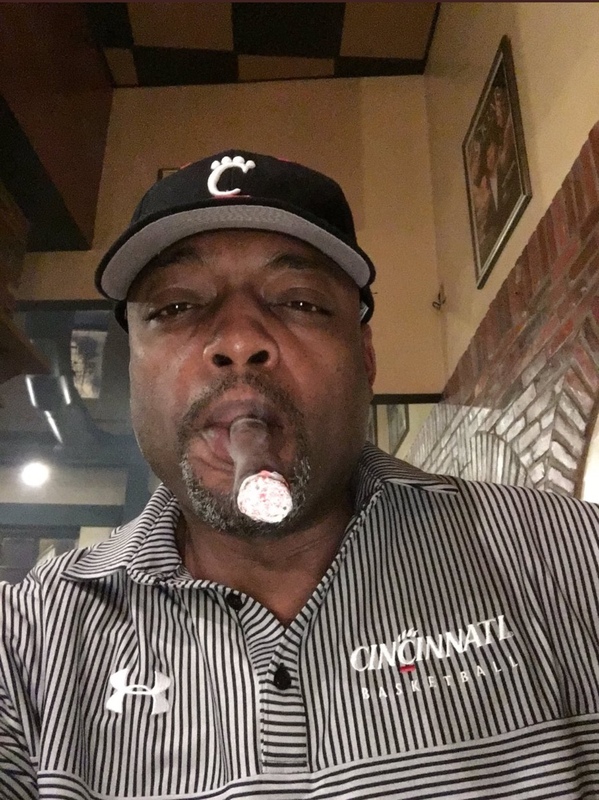 If you’re wondering what Van Exel did for the Bearcats program check this out. You can tell me that NVE would have a hard time recruiting and I would tell you that he wouldn’t have it that hard because of his previous statue as an NBA All Star. NVE was a max contract dude in the NBA. He played along side HOF’ers like Shaq, Dirk, Duncan, and Kobe. Kids idolize status like that. If you’re being recruited for D-I basketball its your dream to play in the NBA. Who better to guide you there than a previous NBA All Star and a guy that’s entrenched himself in the NBA since 1993. Imagine LOJO and Curtis under the direction of NVE. Georgetown, St. John’s, Vanderbilt, and Memphis have all hired previous standout alums to coach their program. Vanderbilt just did it early this week, the other three have seem success for a multitude of different reasons. I’m not always one for being trendy but this is one we should follow. Mr. Bohn, call Nick Van Exel get this done. You’ve made all the right calls so far. This one is easy. Don’t over think it.